^ Is Liverpool still the world in one city?. [1 May 2010]. ^ nomis – official labour market statistics. Nomisweb.co.uk. Retrieved on 17 July 2013. ^ 3.0 3.1 Neighbourhood Statistics: Resident Population Estimates by Ethnic Group (Percentages). Office for National Statistics. [20 May 2011]. ^ Bartlett, David. Census data shows Liverpool's population has risen by 5.5% to 466,400. Liverpool Daily Post (Liverpool). 17 July 2012. ^ CITY LEADERSHIP: GIVING CITY-REGIONS THE POWER TO GROW ADAM MARSHALL AND DERMOT FINCH/LIVERPOOL BRIEFING/Liverpool and its City-Region (PDF). London: Centre for Cities: 1. 2006 [16 September 2012]. （原始内容 (PDF)存档于2013年5月2日）. 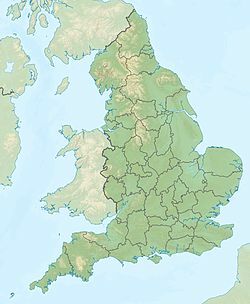 ^ Many people "self-identify" as Liverpudlians or Scousers without actually being born or living within the city boundaries of Liverpool. Many people from within the greater Merseyside area consider themselves thus, although many do not. Conversely, a number of people from Liverpool itself may not consider themselves Scousers, since the term for them may have pejorative overtones. ^ Ten facts on Liverpool. London: Daily Mail. [23 March 2013]. 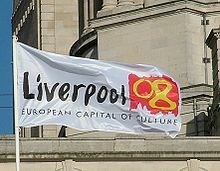 ^ Report on the Nominations from the UK and Norway for the European Capital of Culture 2008 (PDF). [11 July 2008]. （原始内容 (PDF)存档于2008年8月19日）. ^ Liverpool – Maritime Mercantile City. UK Local Authority World Heritage Forum. [9 October 2008]. （原始内容存档于2008年4月23日）. ^ Vision of Britain: Liverpool population 互联网档案馆的存檔，存档日期2007-10-11. ^ Costello, Ray. Black Liverpool: The Early History of Britain's Oldest Black Community 1730–1918. Liverpool: Picton Press. 2001. ISBN 1-873245-07-6. ^ Culture and Ethnicity Differences in Liverpool – Chinese Community. Chambré Hardman Trust. [6 August 2008]. （原始内容存档于2009年7月24日）. ^ 15.0 15.1 Culture and Ethnicity Differences in Liverpool – European Communities. Chambré Hardman Trust. [6 August 2008]. （原始内容存档于2009年1月10日）. ^ Coast Walk: Stage 5 – Steam Packet Company. BBC. [6 August 2008]. ^ Leaving from Liverpool. National Museums Liverpool. [6 August 2008]. ^ Neighbourhood Statistics: Country of Birth. Office for National Statistics. [24 August 2008]. ^ 19.0 19.1 Neighbourhood Statistics: Resident Population Estimates by Ethnic Group (Percentages). Office for National Statistics. [13 September 2012]. ^ Ghana Mapping Exercise (PDF). International Organization for Migration. [13 September 2012]. （原始内容 (PDF)存档于2012年3月4日）. ^ Liverpool's Latin quarter – just around the corner. Liverpool.com. [13 September 2012]. ^ Malaysia Mapping Exercise (PDF). International Organization for Migration. [13 September 2012]. （原始内容 (PDF)存档于2012年3月4日）. ^ Islam and Britain. BBC. [13 September 2012]. ^ Liverpool Merseyrail. UrbanRail. [17 July 2015]. ^ Extending Rapid Transit Merseyrail. Localwiki. [7 July 2008]. ^ Glasgow Trains. Renaissance Trains. [26 May 2009]. ^ Liverpool Waters news- Planning permission granted 互联网档案馆的存檔，存档日期2012-03-18. ^ Peel Shanghai Tower. Liverpool Shanghai Partnership. [11 June 2010]. （原始内容存档于2012年3月8日）. ^ Secondary schools in Liverpool. BBC News. [10 January 2008]. 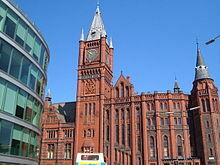 ^ Liverpool College. [23 April 2007]. ^ Grade I listing for synagogue. BBC. 2008-03-03 [2009-07-11]. ^ Listed buildings. Liverpool City Council. [2008-09-21]. （原始内容存档于2008-10-17）. ^ Historic buildings. Liverpool City Council. [2008-09-21]. （原始内容存档于2008-06-08）. ^ Historic Britain: Liverpool. HistoricBritain.com. [2009-07-13]. 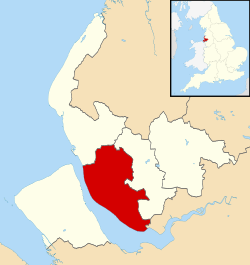 ^ Merseyside Facts. The Mersey Partnership. 2009 [2009-07-13]. （原始内容存档于2007-09-19）. 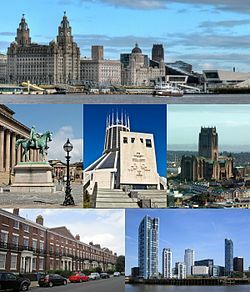 ^ "Liverpool – Maritime Merchantile City". [2008-05-26]. ^ Jones, Ron. Albert Dock, Liverpool. R.J. Associates Ltd. 2004: 46. ^ Helen Carter. Glory of Greece, grandeur of Rome ... and docks of Liverpool. London: Guardian Unlimited. 2003-03-07 [2007-03-27]. ^ Trading Places: A History of Liverpool Docks (Stanley Dock). Liverpool Museums. [12 April 2008]. （原始内容存档于2008年10月28日）. ^ Hughes, Quentin. Liverpool City of Architecture. The Bluecoat Press. 1999. ^ Oriel Chambers. Liverpool Architectural Society. [2009-07-14]. （原始内容存档于2008-09-22）. ^ Cousens, Belinda Cousins. Speke Hall. National Trust. 2006: 5. ^ BBC News. BBC. [2012-05-12]. ^ The Cathedrals of Britain: Liverpool’s Cathedrals. BBC. [2009-07-15]. ^ Liverpool Cathedral. VisitLiverpool.com. [2009-07-15]. ^ Coslett, Paul. Once Upon a Time at the Adelphi. BBC. 2008-06-20 [2009-07-15]. ^ Liverpool City Council: twinning. [17 November 2007]. （原始内容存档于2010年7月6日）. ^ Declara cidades-irmãs as cidades do Rio de Janeiro e de Liverpool (PDF). [2 March 2011]. （原始内容 (PDF)存档于2009年3月26日）.